Dr. Radu is very experienced creating comfortable, beautiful-looking dentures. Traditionally, dentures have been the solution for people missing all their teeth or when the teeth are beyond repair. When the teeth are missing, a person’s face tends to collapse around the mouth, cheeks and chin area. This is due to bone loss that occurs when teeth are missing. When Dr. Radu creates your dentures, he designs them in a way that helps restore your appearance as well as fit comfortably. Dr. Radu offers several options when it comes to complete teeth replacement. He has extensive experience in providing high-quality dentures. He gets beautiful results with his patients and completely stands behind his product. For patients looking for even more comfort and stability, as well as the ability to eat the foods they want, he also provides a variety of implant-supported dentures as an alternative to traditional dentures. If you are in need of dentures, or if you are uncomfortable with your existing dentures and would like to know what your options are, Dr. Radu will answer all your questions. Dr. Radu examines your mouth, gums and bone structure. He listens to your concerns and answers all your questions. Together, you set expectations and discuss options. Dr. Radu uses his CT scanner to get high quality 3D images to properly evaluate your bone health and analyze your bite. Your dentures are made in Dr. Radu’s lab and he follows up with you for any needed adjustments. With as little as two implants, Dr. Radu can add comfort and stability to your dentures. If you are a denture wearer and would like to improve the comfort and stability of your dentures, Dr. Radu can place two or more implants in your jaw and retrofit your existing dentures to snap on to them. One of the disadvantages of traditional dentures is that it’s hard to keep them stable. Even dentures that once fit well tend to become loose and uncomfortable after a while. Another disadvantage of conventional dentures is their poor chewing power, around 20-30% of normal chewing power after one year and it continues to worsen over time. This makes it difficult to eat the foods that you like or need. Denture stabilization helps restore chewing power. The more implants used, the more chewing power is restored. Dentures sit on soft tissue and rely only on suction to stay put. With denture stabilization, two or more dental implants are anchored into the hard bone below the gum. The dentures are then attached directly to the implants. The dentures won’t slip, and you can eat what you want. 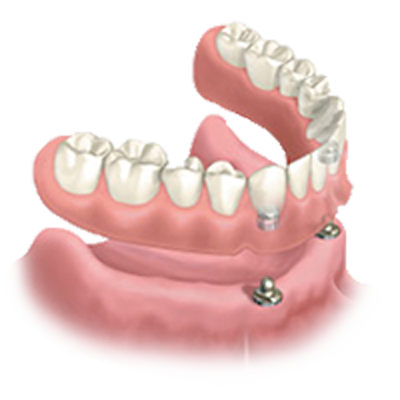 Denture stabilization using dental implants also provides bone stimulation and helps prevent bone loss. They look natural and feel stable when you eat or speak. The size, shape and number of implants to be used depend on your individual situation. Dr. Radu goes over all the options with you. Full dentures – Dr. Radu provides beautiful, functional dentures that fit your face and personality. Partial dentures – Traditional partial dentures are held in place by metal clasps that go around existing teeth to secure the partial dentures in place. Immediate Dentures – These are designed to go in place immediately after teeth extractions. Dr. Radu sees that you won’t go without teeth while your permanent dentures are being fabricated and your gums are healing. Removable Implant-Supported Dentures – Implant-supported dentures won’t slip out and can be easily removed by the patient for cleaning. Fixed Implant-Supported dentures – Dr. Radu’s Stable Teeth Today™ uses five to eight implants for a natural looking, stable denture. This one restores most of your original chewing power. Denture Stabilization – Dr. Radu can retrofit your dentures with two or more implants to give you no-slip, no-adhesive dentures. Relines and repairs – Dr. Radu takes care of relines and repairs here in his in-house lab. Thought about getting Dental Implants?